There’s a new meme going around the SQL Server blogosphere called T-SQL Tuesdays. A bunch of SQL Bloggers all post about the same SQL related topic on the same day. Back at the beginning of January fellow MVP Jen McGown (blog | twitter) wrote a blog post about resolutions for the new year. Granted I’m way too late to be included in that round of SQL Server related Tuesdays, but thought it was a great idea and wanted to put up my resolutions. Since it’s February it’s a little late for new years, maybe we can call them Ground Hogs’ day resolutions? Produce more variety – I’ve been doing a lot of content for Pluralsight, I want to continue putting out good content for them, but want to put out other content as well. I want to try and blog more, and hope to self publish a few books on the Kindle platform. Consume more – As much as I love to produce content, I recognize that I need to do a better job of consuming more. My Kindle has been a big help with that, having a huge library available all the time has made it easy to switch between the subjects I want or need to learn about. Balance my consumption – While I love technical books, I realize to be a true professional I need a good balance. I’ve started reading a lot of what I call “professional” books. Books that give me insights into things like business, community, time management, and teamwork. Better balance of family life – Let’s face it, us really aggressive type A folks work a lot. When we’re not doing our 9 to 5 job we’re producing content like blog posts, books, videos, or are off at some user group meeting or weekend event presenting. This has a definite impact on the family. While my family is incredibly understanding, we still miss each other. So I’m working on some creative solutions to this issue. Get my next certification – Last year I earned my MCTS for SQL Server 2008 Business Intelligence. This year my goal is to advance that and earn my MCITP also in SQL Server BI. More Beta work – The CTP for the next version of SQL Server is now out. I want to spend more time working with it so when the final version is ready I’ll be well up to speed, plus better able to share the new features with the community. I suppose this list is identical to the list of many people. but if I put it in writing I’ll be able to both measure it and hold myself accountable. There are many ways to learn. Attending a presentation or live webcast is great because you get what I call “condensed knowledge”. You get the results of someone else spending thirty to forty hours of learning and working to condense it into a one to two hour presentation. You also get immediate feedback, you can interact with the presenter and ask questions. On the downside, if you missed something, you missed it (unless the presentation is recorded). These are great for getting an overview, however you won’t really get deep technical understanding out of a presentation like this. The next step beyond a live presentation is a recorded webcast or video, such as those produced by DNRTV. These are great because you can pause them, rewind, and listen multiple times. However, you lose the ability to get immediate feedback from the presenter, and like live presentations it’s condensed knowledge. Online reading is the next area available to us for learning. Blogs, MSDN, TechNet, etc. These have a much deeper level of information than previously mentioned formats. Plus they tend to be updated as changes are made. However, there do tend to be some limitations. Content is not quite as polished as a book as often it does not go through professional editors. Also, while the content will be more in depth than a presentation, it will still be limited in scope. It will be rare to find the equivalent of a book given out for free in a blog. Most of the time it will be equivalent to a really long magazine article. This then, brings us to good old fashioned books. For true topical mastery, there’s nothing like a good thick book filled with code examples for learning. Some pundits are already predicting the death of the print book. However, in my opinion print is simply a medium. Books could be read online, or downloaded to something like a Kindle. Whatever the form, it’s still an in depth presentation of content. So does this mean you should favor books over other forms of learning? Absolutely not. If you recall yesterday’s post, I mentioned being able to keep up your base. Podcasts, webcasts, user groups, and blogs can be great ways of doing just that, while using books for honing your expert skills in some topic. Deciding on a delivery mechanism for your learning is the first step. Now you need to decide the process. Learning is a gradual process. It takes learning a little something every day for it to take hold. Even as little as 20 minutes a day can rapidly bring your understanding up to new levels. Avoid cramming, cramming works for short term but studies show long term retention is not good. For ultimate learning, start with a goal. Decide what you want to know. Then gather the materials you’ll need: books, articles, manuals, blogs, etc. Next, schedule the time. As I mentioned you want at least 20 minutes a day devoted to learning. Turn off your e-mail, close your twitter, turn off the radio, close the home office door, and focus on the material. Practice what you read as well. Type in the code samples, run them, debug them, step through the code line by line. Make changes and see how it affects the flow of the code. Find the patterns and practices for your environment and try them out. Using an iterative process you will soon be on your way to expert level knowledge. If you recall my “Good Reads” post from June 25th, you will remember I am a big believer in books as a learning medium. I like to employ a lot of different ways to learn: user groups, blogs, podcasts, videocasts, and magazines to name a few. But for really in depth coverage, it’s hard to beat a nice book in your hands. I got some good feedback from my mention last week of Andy Leonard’s new e-book on Data Dude, so I thought that I would continue by adding book reviews to the blog every so often. 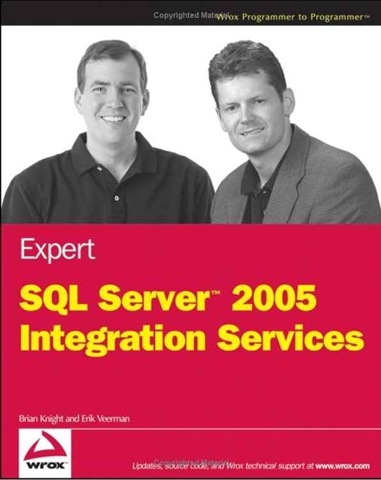 For this review I thought I’d cover a book that seems to constantly be on my desk lately: Expert SQL Server 2005 Integration Services, by Brian Knight and Eric Veerman. This book does a really good job and is specifically targeted toward the data warehousing professional. One entire chapter is devoted to ETL for dimension tables; another chapter focuses on the fact tables. It was great to have coverage so focused on these topics. Another favorite part of the book is the two chapters on deploying and managing SSIS packages. So often these topics are glossed over, especially the managing piece. The book does a great job in covering all the tools and practices around this subject. I’ll mention one more chapter, one that focuses on package reliability. They cover logging, auditing, event handling, checkpoint files, and even suggestions on testing error handling logic. There are many more chapters in the book, such as migration from DTS (SQL Server 2000) and Scalability, for you to discover. The other thing I love about this book is the brevity. The authors cover an amazing amount of information in just 382 pages. As a busy, busy person I very much appreciate the conciseness they achieved without sacrificing any clarity. I’ve met both authors, and have heard them speak. They are both very nice, knowledgeable individuals, and I highly encourage you to attend one of their presentations if you get the chance, or if not at least buy their book from your favorite retailer; you will find it a great investment.